Phytelligence's Tyson Koepke in the company's lab in Pullman. In the tree fruit industry, time can be the biggest impediment. After all, what is more unchanging than the time required to grow a tree? "The nursery business is one of the slow parts," says Doug Hemly, a fifth-generation pear grower from California. "Once you know what you want to do, you have to get the tree grown correctly and as quickly as possible. And you want it to be consistent. You want it to be reliable (so) that you get exactly what you ordered." Until recently, Hemly and other growers like him had to make the best of the situation. Apple orchards covet the most productive and resilient trees, but there aren't enough to go around. Pear growers see little research done to improve breeding in their crop. But that could change as a Pullman-based company takes root. Phytelligence — a Washington State University startup — found a way to accelerate the natural process of growing trees, nearly cutting the time in half while saving 200 gallons of water per tree. Such an innovation could bring unheard-of flexibility to some of Washington's most bountiful crops, allowing growers to adapt sooner to consumer demands or replenish orchards ravaged by disease. Years ago, a WSU plant geneticist wanted a soil-free way to grow more plants more quickly to aid his research. An expert in fruit, Amit Dhingra directed his research assistants to divvy up species: sweet cherries, apples, pears, grapes, and strawberries. "I started 3,000 [sweet cherry] buds and lost them all in the research lab because we were starting from scratch," says Tyson Koepke, who worked in Dhingra's lab. "We were just trying to make the process work for further experiments." They found success growing plants in solutions that Koepke describes as "jello with Flintstones vitamins for plants." In that nutrient-rich media, one bud can multiply into 250,000 individual plants in a year. Thanks to insight from an undergraduate working in the lab, Dhingra's team learned that its methods, if applied commercially, could relieve a longstanding bottleneck in the fruit industry. Where growers typically have to wait three to five years for new trees propagated at a nursery, these researchers invented a way to yield fruit in 12 to 18 months. Phytelligence started production in 2013. 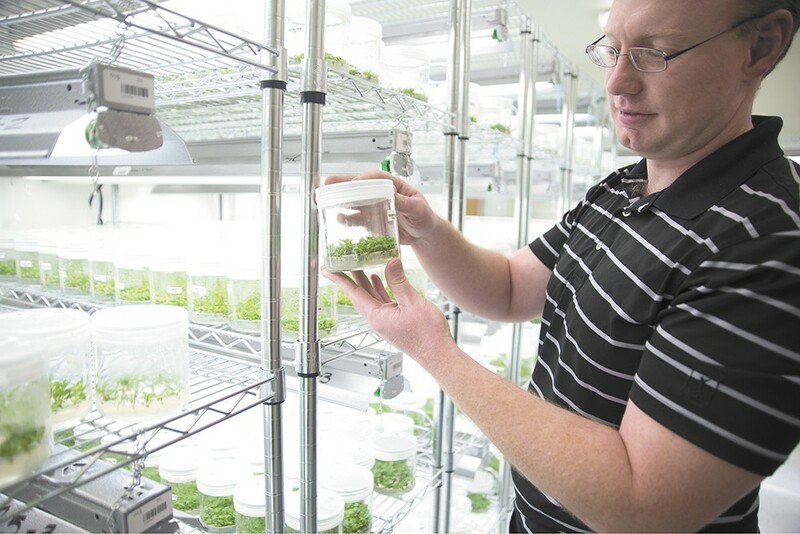 Plants, including 11 different species, grow for about four weeks in jars crowded on shelves, filling three rooms in the office at WSU's Research and Technology Park. After a month, each plant is cut into two or three pieces, creating two or three new plants. The process continues and the numbers add up quickly. When the time is right, Phytelligence moves the plant into media that tells it to grow roots. Then it's transported to a nursery near Seattle, where it will live in a pot until it's 18 to 24 inches tall. The plant is a dormant stick called a rootstock, Koepke says. Once it's planted in the ground, it can be budded in the same season, which means the grower inserts a stem with leaf buds into the rootstock. Altogether, Phytelligence shaves two years off the traditional process. Last fall, a cherry grower in Washington became the first to plant trees propagated in the lab. "The Phytelligence approach lends itself to a lot of the concerns that have been present over the years," says Hemly, who invested in the company. He hesitates to plant new trees because committing four or five years in advance is daunting. A lot can change in that time. In the end, he might not even have the right tree. "One of the big issues in the industry has been cross-contamination. People are sold plants that aren't what they're supposed to be. You wait three to five years to realize the tree isn't growing right," Koepke says. Phytelligence genetically tests each tree. It's the only nursery with that level of quality control. With that kind of assurance, combined with speed, Hemly feels more positive about the possibilities for his orchards.